Early days yet, but the National Party seems to be having trouble in finding a credible line of attack on Jacinda Ardern. Interestingly, the National campaign manager Steven Joyce didn’t go straight for the “pretty little thing/lightweight” criticism that’s been tried so often before. Wisely, Joyce seems to have realized there would be a fair amount of blowback (especially from women voters) if he condescended to her, or tried to mansplain the economy for her benefit. 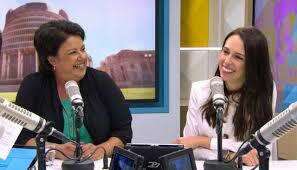 Instead, the job of patronising Ardern was given to Paula Bennett, who blew it on the weekend’s The Nation by claiming – ludicrously- that Ardern had been imitating her, the original Sunshine Girl. “I feel like she’s stolen my relentless positivity so I’m going to go for eternal optimism,” Bennett said, somewhat less than adorably. For the first time in nine years, National is now finding itself in the unpleasant position of having the poorer communicator in the top job. Supposedly, the classic electoral test hinges on which candidate the average voter would most want to share a beer with, or sit beside on a long international flight. By that measure, Winston Peters and Ardern would top the lists of most voters by a wide margin. The Greens duo would be too worried about the plane’s carbon emissions, and Bill English is less the chap you’d want to share a beer with, and more the type you’d pick as your designated driver. We should be counting our blessings. Until last week, Election 2017 had been sinking beneath a surfeit of earnest-but-dull blokiness. Frankly, it was not going to be much of a party if Gareth Morgan was the excitement factor. Good men and true though they be, neither English nor Andrew Little are the kind of politicians able to inspire spontaneous cries of “Three More Years Of This!” from any part of the electorate. In fact, much of the excitement caused by the sudden elevation of Ardern is partly due to a grateful nation’s sense of relief. In the nick of time, we’ve been spared from having to watch several television debates between Andrew Little and Bill English. Faced with that prospect, many of us might not have made it to election day. Supposedly, Ardern’s low hanging electoral fruit are the urban liberals recently gone to the Greens, and the older, conservative voters who switched some time ago to New Zealand First. Pointedly, Winston Peters has tried to stop his recruits from drifting back to a revitalized Labour. He’s now saying that a referendum on the Maori seats will be a pre-requisite for any coalition deal with Labour. There’s no chance of such an ultimatum being accepted. All Peters was trying to do was to remind his crustier followers that Labour is still supporting what New Zealand First regards as racial privilege. In other words, this was Peters doing his own rendition of Joyce’s ‘new wrapper, same old policies’ theme. National is basing its entire campaign on a boring-is-good claim of providing security and economic stability. That message didn’t work very well for Theresa May. Plenty of anecdotal evidence exists to the effect that in their personal lives, many middle class voters are feeling that their jobs and their communities are becoming less safe and secure, not more so. In particular, the public health system is hardly providing a good advertisement for National as a safe pair of hands. On any given day of late, the media has carried stories of the health system failing in its most basic roles, primarily thanks to years of systematic under-funding. Patients are going blind or are dying of cancer on waiting lists while Health Minister Jonathan Coleman remains in denial about the existence of a funding crisis. Health is one issue where Labour could really reconnect with those older, conservative NZF voters. This past week though, the focus has been on transport policy – where the two parties disagree on the funding model, and the pace at which a game changer for Auckland’s chronic traffic problems can be delivered. Labour is promising light rail to the airport in ten years. National, typically, thinks that’s (a) too soon, especially if (b) it can take the opportunity to score a few cheap ‘tax and spend’ points at the expense of the centre-left, given that a regional fuel tax will need to be part of the light rail equation. Yet at least Ardern and Auckland mayor Phil Goff seem to actually engaging with the issue. Perhaps a regional fuel tax is all the evidence that National has been looking for in order to paint Ardern as the Red Menace – but voters might actually come to prefer a government that isn’t willing to go AWOL quite so often on the issues that affect them. A few days ago, I linked to the “White of An Eye” track by Patience, which wryly referenced the electropop of the late 1980s, circa Yazoo. Much earlier, a band called Pylon had kicked off the decade – and ignited the music scene in Athens, Georgia that eventually gave us REM and the B52s – with a brilliant run of singles and albums that ended in 1983, when the band packed it in prematurely because they just weren’t having the same kind of fun anymore. It was becoming a business.